This morning, as I sat in a waiting room full of screaming children for my appointment with an NHS nurse¹ — which was more than an hour and a half late due to traffic hold ups on the A40 — I got a phone call from a recruiter. Due to the situation, he said he’d call me back when I got home, and in what may be a first for recruiters everywhere, he did! Anyway, we spoke, discussed my employment situation and then having promised to send me a job specification for a position in The City™², he asked me to respond to the email when I get it, and hung up. Meanwhile, I had other things to do. I’d rushed out early for this appointment and hadn’t had time for a coffee not breakfast before going. I saw to that and went through my emails for the job-search results of the morning. This took about an hour once I’d filtered out the obviously unsuitable stuff, made notes and applied for what I thought I’d have a chance at. Then I took a break for lunch and did a little mine-crafting. Louise runs a multi-player server and she and I are building a transcontinental mine cart railway, mostly for fun, partly to make life easier for everyone. 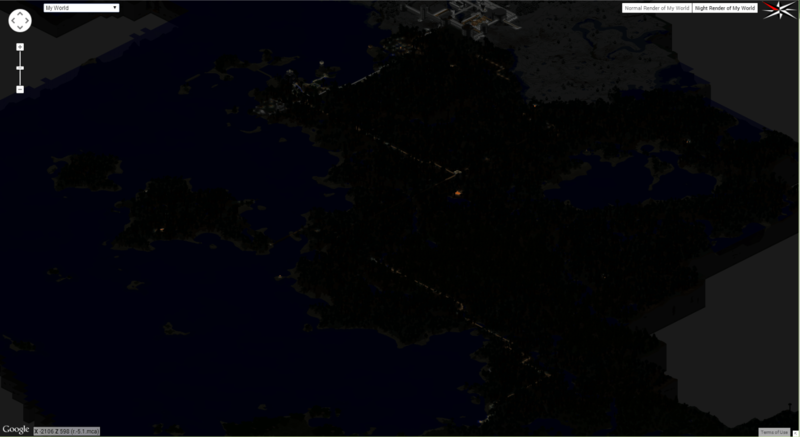 It started with me building a railway to connect my tower to her farm, where she’d built a network of rails towards the global spawn point and the builds of several other players on the server. Since then it’s been extended, and we’re making our way south to where Louise built a pyramid, and south west to the only village that has so far been discovered. It’s a huge undertaking but it feels like we’re nearly there. The image on the right shows the course, from the major builds at the top of the screen as it winds its way down. It’s a night-render so that the lights along the track show it up better. The only major problem with this is resources. Iron for rails, gold and redstone for power. And that’s before you need to replace all your worn out tools, and then build fences along the track to stop animals wandering onto it. Anyway, I can’t spend all day on Minecraft, and so I logged out and got this picture for the blog. I now have to do the afternoons job-searching. Did I ever mention that it’s a full time job being unemployed? Oh, and the job-spec I was promised about 11 still hasn’t arrived. ¹ The latest injection in a tri-monthly series. Shouldn’t be many more to go. ² I know it’s not really a ™ but it should be.